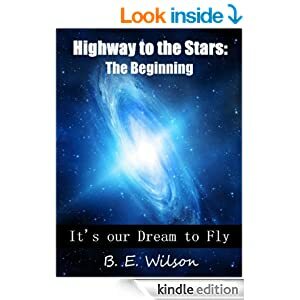 Highway to the Stars by B.E. Wilson is the story of a group of guys that work together trying to develop alternative fuels that will yield much higher mpg's than conventional gasoline. When layed off by their employer, the team decides to continue their research on their own. During a testing mishap they turn a potentially disastrous error into the discovery of a life time. Many times I am reading multiple books at the same time, switching back and forth as my interests seek different stories. It just so happens that I started reading Highway to the Stars as I was also reading another book that turned out to be similar enough to mention in this review. 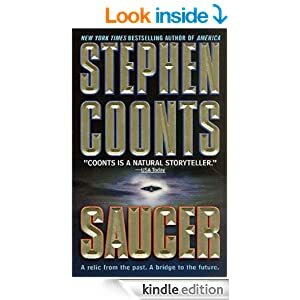 Saucer by Stephen Coonts was my other read. Now, usually I reserve my book review blog for featuring the works of indie authors or small publishing companies. However, I enjoyed both of the stories so much and found them both to be similar without being the same, that I thought that I would make an exception here. The great group of guys in Highway to the Stars harness their new found technology and develop various crafts to be powered by said alternative fuel source. Eventually, as the title suggests, they even design and build their own spacecraft. This is where the two stories become very much alike. Saucer and Highway to the Stars both feature a sought after piece of technology that both world governments and criminal businessmen are willing to go to great lengths to acquire. This delves our heroes into a race that puts them out of their depths and demands that they find the courage and resolve to rise up to their calling. If at all possible, I would recommend to my readers that you read these two books as a 'double feature'. You will see for yourself how two very different authors have both devised action packed books with great characters, while spinning similar tales, yet different enough to not be the same story. I haven't read Coonts in years. Like you I tend to gravitate toward indies. Looks like a fun double feature, but I'll probably grab the Coonts from the library.